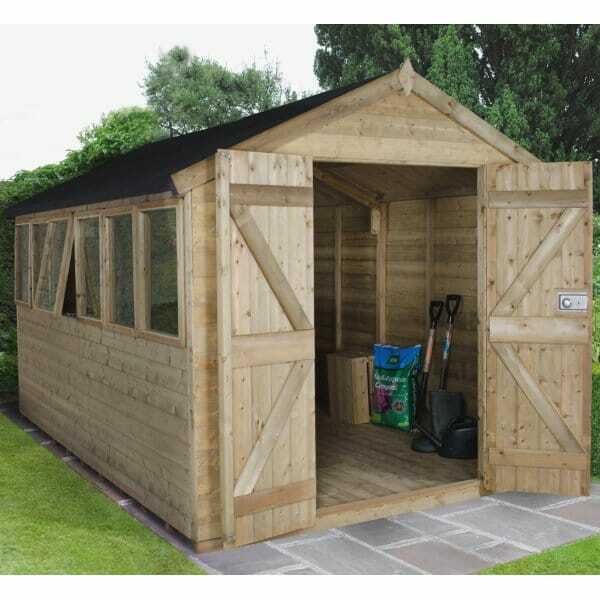 Forest Garden 8 x 12 Premium Tongue and Groove Pressure Treated Apex Shed: This large premium quality garden shed is the perfect place to store large garden tools and equipment or similarly for use as a workspace in the garden. This shed has protection against the elements with the tongue and groove pressure treated panels which are tight fitting to keep the wind and rain out. The shed benefits from pressure treated tongue and groove floor boards and a tongue and groove roof which is covered by the included waterproof shed felt roofing material. This garden workshop features a double door to the front for easy access in with larger equipment, the door has high quality stainless steel hidden hinges and a door handle, door lock and included keys for added security, the door also has double Z framing for added stability and strength. The 6 windows will allow in plenty of light and ventilation as they are opening windows and they are glazed with premium acrylic. All the timber in this shed is FSC certified and obtained from a sustainable source for your peace of mind. This wooden shed is delivered in easy to manage sections and is designed for easy self-assembly by 2 or more people.